Allie and I were taking this morning how neither of us *ever* check the weather anymore. It's been on PerfectWeather™ autopilot since the June Gloom belatedly moved out in early July. 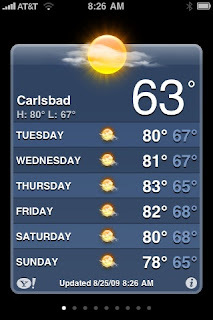 So after we talked about the weather - or lack of checking it - I checked the phone to see what's in store for Carlsbad the next few days. Lookin' good - if a little on the toasty side. Might have to (gasp!) get the fans out. At least this forecast changes from time to time over here. Combine this "heat wave" and bigger swells and I may just have to head on down to the beach after work one (or more) of these evenings.